There are so many elements that make up search engine optimisation. And it all hides neatly behind the scenes; web users search for something on Google and, within seconds, find a website that delivers the exact answer they were looking for. The months of planning, strategizing, implementation and monitoring that go into producing those relevant search results and, in turn, benefitting the business behind the website in question, are easily overlooked. For all of us working in SEO, this can be rather frustrating, because we know just how hard it is to run a successful SEO campaigns nowadays. But how do you effectively plan, undertake and analyse your SEO work? For many, they’ll rely on notebooks, sticky notes, reminders and to-do lists, but that can all get rather cumbersome. Such an approach can also stifle productivity and creativity – two incredibly important facets of a great SEO campaign. That’s why I’d like to let you in on a little secret: mind mapping. Our brains are full of great ideas, but fishing them out can be very tricky and some of the best are often lost forever. Mind mapping is an ingenious process which forces us to retain and visualise our thoughts. That doesn’t mean drawing pretty pictures – more drawing a physical map of what’s going on inside our heads. Mind maps sometimes look a little different, depending on the style being used, but they all follow the same principle; start with the main theme or topic in the centre of the page, circle it and extend outwards with additional ‘nodes’ that expand upon the initial idea. Colour-coding is used judiciously, and adds to what is already an instantly engaging bird’s eye picture of a large project that practically anyone can digest. 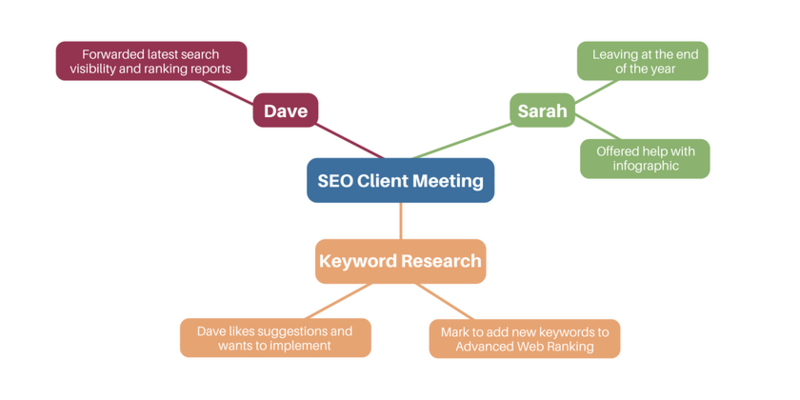 How can mind mapping benefit SEO? Think about how you normally plan an SEO project. It’s that same bunch of notebooks, scribblings and endless to-do lists, isn’t it? A mind map could be a far tidier way of planning the SEO for a client and will enable you to refer to something that instantly makes sense. 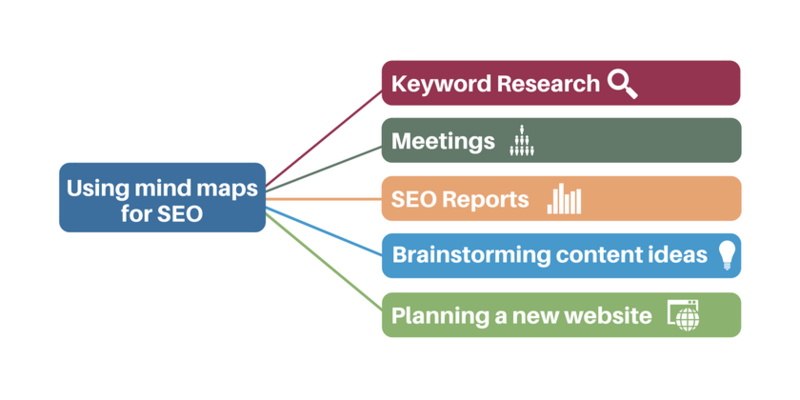 In this post, we’re going to look at some of the ways mind maps can be used for SEO. The ability to visualise your keyword research is incredibly useful. Mind maps help you do that and brainstorm keyword ideas. You simply start with the main keyword in the middle of the page and go with the flow. For example, if we’re going to do a research around ‘mind maps’, we’d circle that as our main topic on the mind map. The first branch of nodes may then be the various uses for mind maps, i.e. 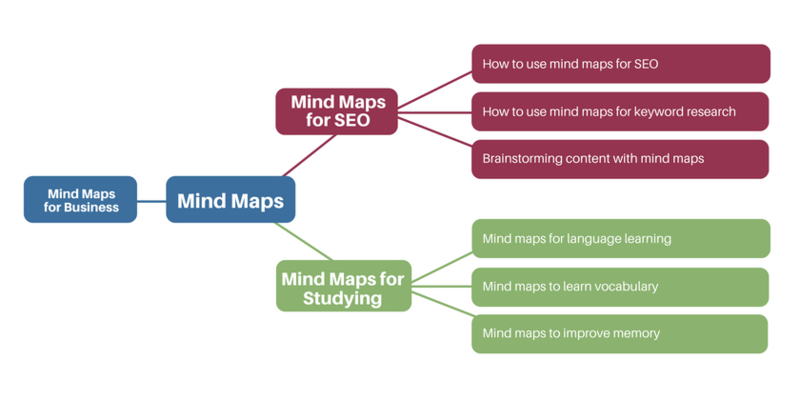 ‘mind maps for SEO’ or ‘mind maps for studying’. From there, we can start to define our long-tail keywords, which may be phrases such as ‘how to use mind maps for SEO’ and ‘mind maps to improve memory’. The ideas can then literally be poured out onto the mind map and, by breaking up the process into specific chunks, you’re unlikely to be scrabbling around for keywords – they should come naturally. Of course, this process is not going to replace your existing keyword research workflow, you will still need to do all the homework on keyword difficulty, relevance and monthly search volumes. Mind maps can however help with the initial creative brainstorming of keyword ideas. Coming up with content ideas is hard. Even writing one blog post per week can prove difficult if inspiration appears to be thin on the ground. This is where mind maps are, again, incredibly useful. By brainstorming content ideas on a mind map, you’ll forever have your pick of topics and an easy and conducive way to brainstorm future pieces. 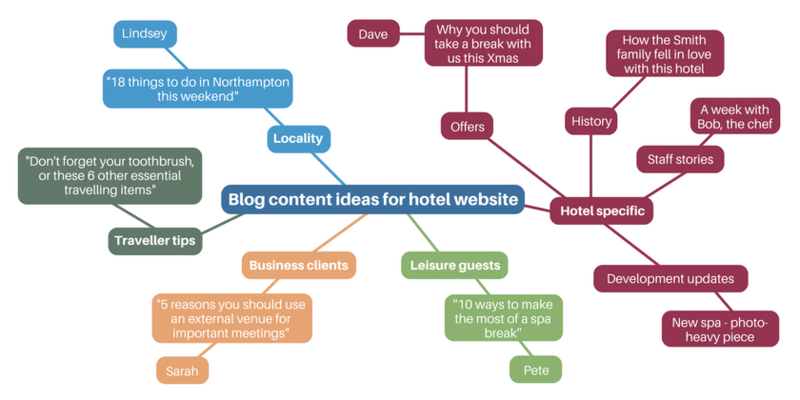 The blog post you’re reading is doing exactly what we’re about to suggest – it uses mind maps within the content itself in order to provide visual guides and something rather more interesting than a page full of words. Visual content is really ‘sticky’ on the web, which means people are more likely to engage with the stuff you produce for your client and consequently spend more time looking at it. That means better engagement and hopefully more leads. As I’ve demonstrated in this post, you can use mind maps for all manner of purposes, so if you’re trying to explain something that is relatively dull or complex in a blog post, use a mind map to visualise what you’re writing about. Meetings are a big part of SEO and play a vital role. Unfortunately, they are rarely quick and never follow a linear path, no matter how hard we all try to keep them on track. If you’ve ever cursed at the state of your meeting notes when you need to refer to them, mind mapping could be the answer. In SEO, they can be put to use at meetings in two ways. Firstly, they offer a brilliant way to demonstrate the work you’re planning to do or have done to a client. Take our keyword research mind map example above – that would be a far better thing to show a paying customer than a boring spreadsheet or a PowerPoint presentation. The second use for mind maps at SEO meetings is for taking notes. Start with the meeting subject in the middle and add nodes for the topics. From each topic, note any pertinent discussions as they happen and record any promises you’ve made as ‘to-dos’. Simple! Referring back to your notes in the future will, finally, be fruitful! The reporting part of an SEO campaign is where you get to show exactly how your hard work is paying off. You can show the increase in visitors, decrease in bounce rates, on-page times going through the roof and exactly which pieces of content are proving popular. And you could use a mind map to illustrate your achievements. Here’s how. The title of the report is the obvious starting point, but from there, you can create nodes for key statistics, the most popular content (and that which isn’t working) and detail on keyword performance. Just like SEO, websites are made up of a huge number of constituent parts and often involve a number of people. You have the designers, SEO people, content writers and, of course the stakeholders within the business. Everyone needs to have their say, offer their input and ensure no great ideas are forgotten. This is where the collaborative benefit of mind mapping becomes apparent. Rather than brainstorming ideas for the website as a big list on a whiteboard, a mind map is far more intuitive and inspiring. Circle the name of the website in the centre of the page and create nodes for every page. From those page nodes, create further child nodes that detail the page elements. You can even add nodes that indicate who’s responsible for each area and any outstanding actions. Nodes can also be created for the elements of the project. For example, you may have one labelled ‘design’, against which you can brainstorm the look and feel of the website itself. 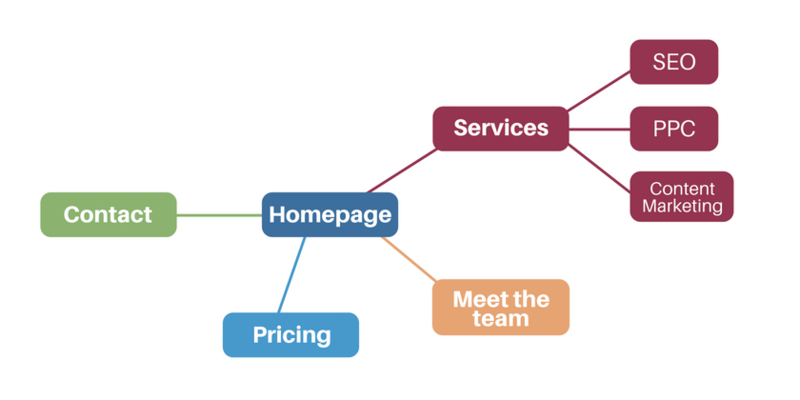 So, we’ve hopefully got you excited about the prospect of using mind mapping for your SEO projects, but how do you go about it, exactly? Mind Map Free. If you’re looking for a way to get cracking with mind mapping software instantly, there are few better options than this. Visit the website and you’re taken instantly into the impressively-featured software itself, enabling you to start creating mind maps right away. SimpleMind. A brilliant and beautiful option for software-based mind mapping that works on pretty much every platform. Mind Node. One for the Apple aficionados. Incredibly easy to get to grips with and, if you’re familiar with Pages or Numbers, follows that same design aesthetic, so is instantly recognisable. Mac and iOS only. Pen and paper. Sometimes, the simplest things work best and it’s hard to argue against good, old-fashioned pen and paper when it comes to the ability to quickly put together a mind map. This methods works best in meetings and can always be transferred to one of the above for digital safe keeping afterwards, if required. Mind maps are brilliant creations. They marry simplicity with creativity and bring the very best out of people. They will not replace your existing tools but can add a bit of creative fun into your SEO projects and I hope this post has demonstrated just how far reaching their impact can be. 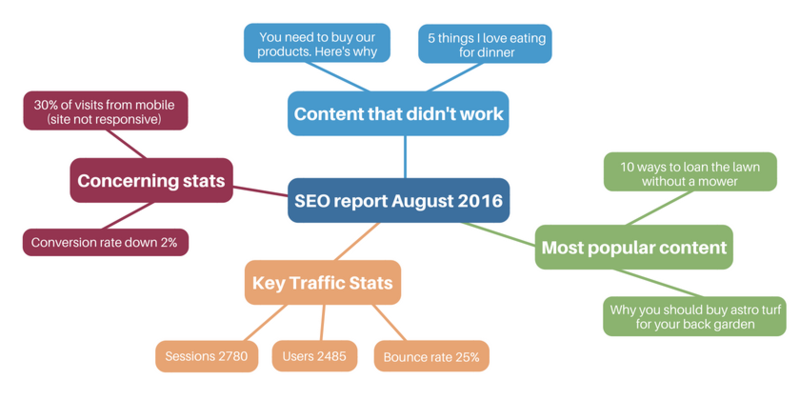 From planning, to client meetings and performance reports to guest appearances in content, mind maps can add a bit of colour and creativity to SEO. I had never thought of using mind mapping for SEO. I’m a big Trello fan for SEO fulfillment, but you make a good case for using it to show clients what they’re paying for. Which mindmap software did you use for your images? I tried MindMap Free, but it didn’t look like yours. I like how yours has more of a spider web look than a traditional mind map. Thanks for sharing, this is very helpful. I work as SEO for a software of mind mapping. I never thought mind mapping would help me with SEO. Which mind map maker did you use? I have been using Edraw for almost 3 years and tried other software like Mindmap, but never get as good as you are! Best of luck to you and I will keep this article, really taught me a lot! I tend to use Xmind for my SEO planning but only a very basic approach. I prefer the look of yours! Tried to contact you before, I’d be interested in hearing more about your use of mind mapping and whether you could further talk me through the approach you outline in this article? Good luck and thanks for a great post. Mindomo. People can work on your maps even if they aren’t registered at Mindomo.